HOME / TRENDING / IT’S RAINING GOLD! 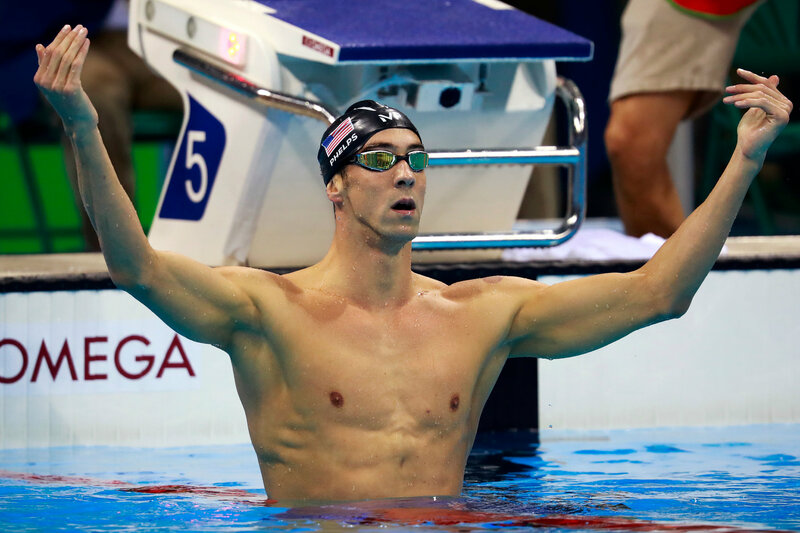 MICHAEL PHELPS WINS GOLD AND TRENDS ON TWITTER! People used to swim in search of pearls, but Michael Phelps is all about the gold! At the Olympics he swam the 200-metre butterfly, his signature event, which earned him a gold medal! Nope, we’re not surprised either. 19-year-old Tamas Kenderesi from Hungary beat Phelps in the semi-finals by 16 hundredths of a second. The final, however, had Phelps turning the tables around. He took a total of 1 minute and 53.36 seconds. This was his 20th Olympic gold, and it sure wasn’t his last! During the 4x200 freestyle relay, he was positioned last and he swam to success, winning a gold again! That’s 21 gold medals so far. Phelps has acquired the world record since 2001, although it was lowered 8 times. Who is he, Aquaman?! More than his medals, his facial expression before his 200 meter butterfly semifinal went viral. He was warming up with a determined face that could cut through water (pun intended). 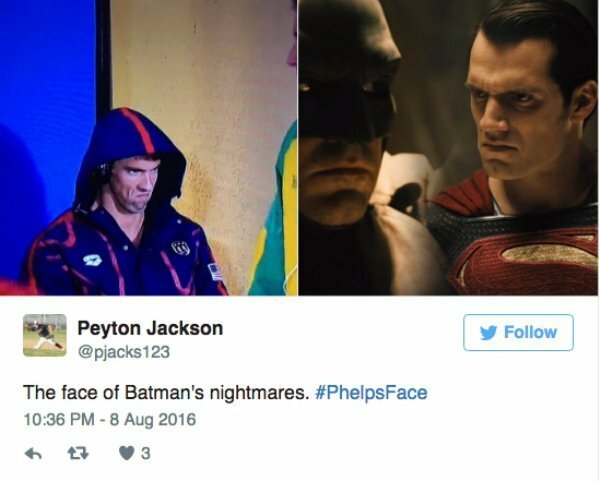 #PhelpsFace is the best Rio Olympics meme ever! Poor Chad Le Clos dancing to music, unaware that an axe murderer is right behind him! You’ve caught Zubat already and you just came across a Mewtwo and NOOOO! Your battery died! That moment when you take credit for something you didn’t even do! 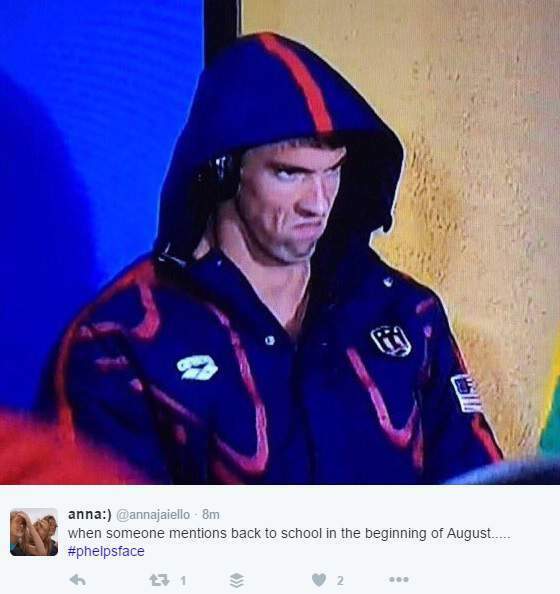 Phelps looks like he was listening to some heavy metal. He was preparing himself to win, because this is the last resort! That perfect moment when you meet your crush alone, and then her boyfriend turns up. Dammit! Phelps, we think it’s time to take you to rehab for your gold medal addiction. That annoying moment when you forget your umbrella and it rains, but when you have it there’s bright sunshine! You can’t hide from us anymore Batman. We know who you are now. You’re enjoying your vacations when suddenly, your friend mentions your workload when the vacation ends. Buzzkill, much? Who else was amazing at the Olympics so far? Dipa Karmakar, that’s who!